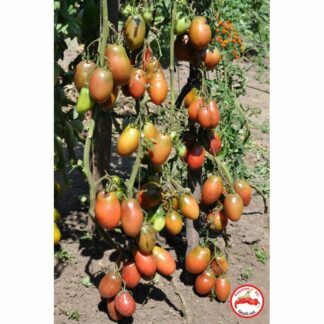 Matures early with plant height upto 80 cm. Fruit weight approx. 80 gr and the taste is sweet. 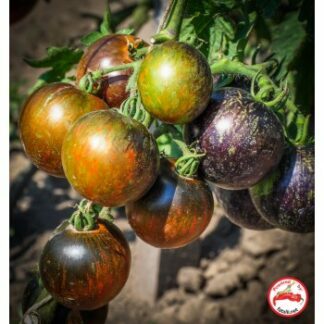 The round fruits have exotic coloring – eggplant-color top and reddish-pink bottom. The flesh is pink colored. 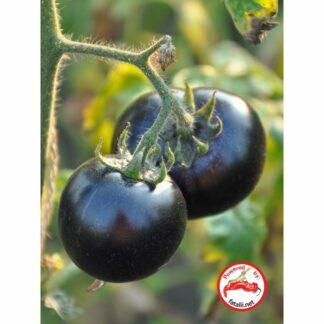 Maturity: early, height: up to 2m, black-colored fruit, globe shaped, weight: 10-15g each, their sweet taste reminds of wine, the plant is covered with fruit. Maturity mid-season. 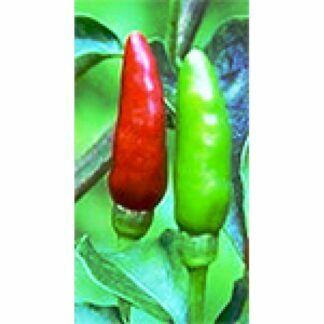 Plant height up to 100cm. 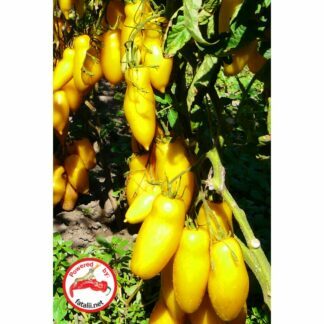 Fruitcolor yellow, Fruit type pear. 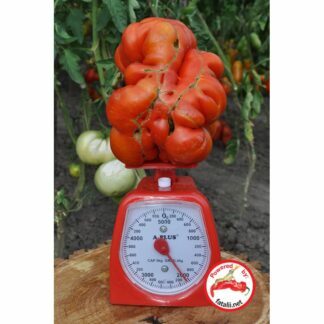 Fruitweight approximately 120-150g. Taste is very sweet. 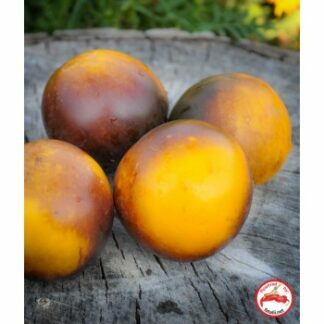 Amber-colored fruits with green strokes. The flesh has pistachio color, very juicy and sweet. 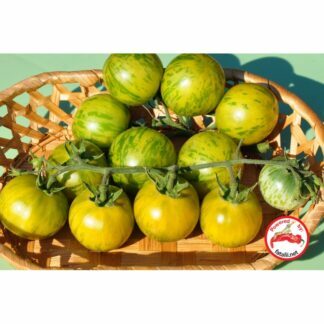 Good for canning, as well as for salads. 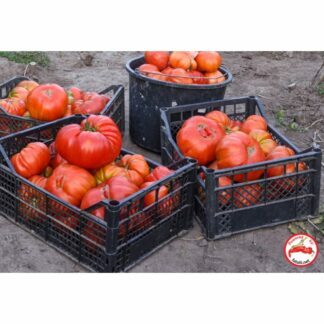 Can be stored for a long me, keeping full vendibility. The name of the volcano mountain in the Bay of Naples (Italy). 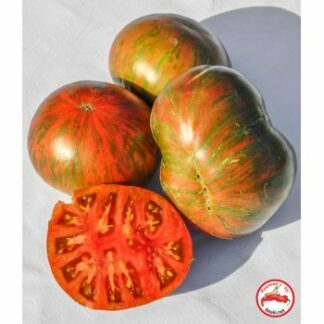 About 1944, in the neighborhood of this volcano the local population began to grow tomatoes very similar to this variety. 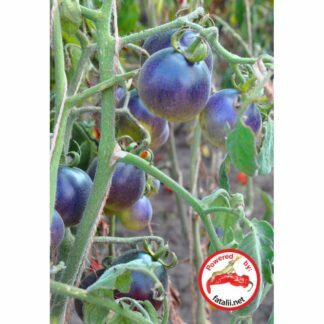 Nowadays the tomatoes called “Piennolo” are still grown there, and they are used for ketchup, canning, etc. This is the best variety for pizza. 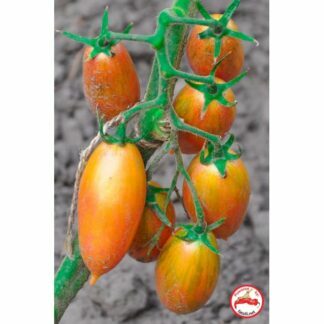 Maturity: early, height: 1.2m, elongated fruit with a smooth pointed end, weight: 70g each, solid flesh. 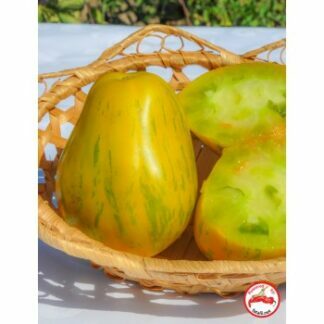 Maturity: mid-season, height: up to 1.6m, the fruit are globe shaped, weight: up to 100g each, color: blue-green with yellow and green stripes. 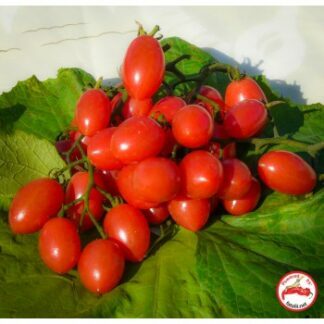 The taste is splendid, reminds of ripe kiwi, bears fruit until frost. 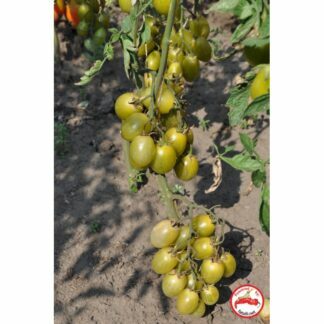 Matures early with plant height upto 110 cm. 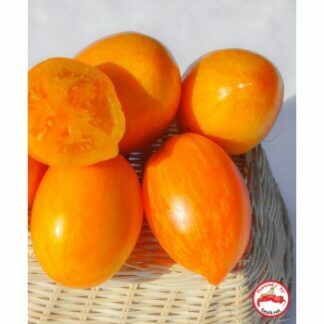 Fruit weight approximately 120 gr. 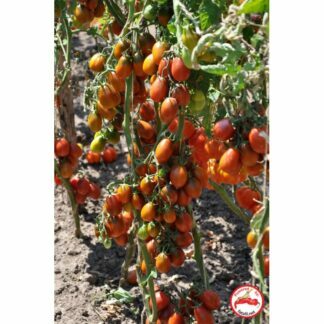 Produces upto 6kg crop per plant. 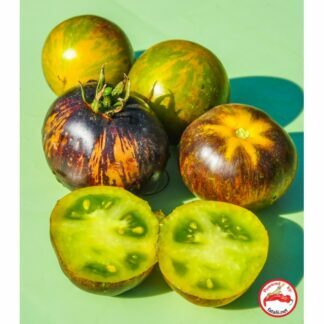 First yellow with green stripes, and then orange with golden stripes when mature. 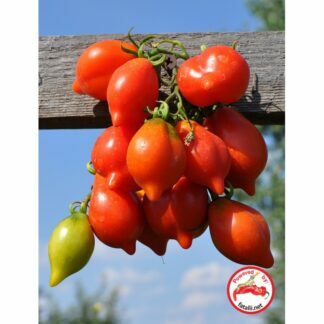 Sweet, very tasty and juicy fruits, perfect for canning. 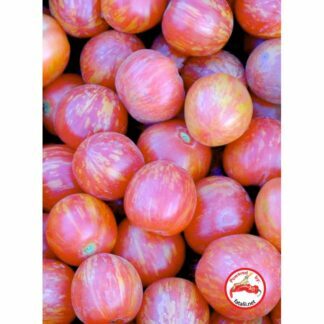 A variety with high content of anthocyanins, maturity: ultra early, height: 1.1m, the fruit are globe shaped, weight 30-40g each, color changes from green to dark purple and then to pink-red with a purple blush when mature. 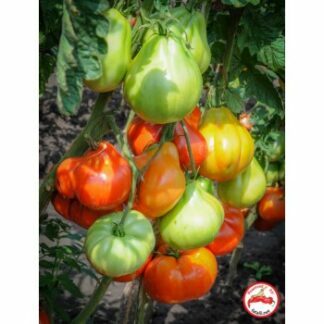 Maturity: early, height: up to 1.3m, fruit have flattened globe shape, weight: up to 140g each, unique taste, especially great for making tomato juice. 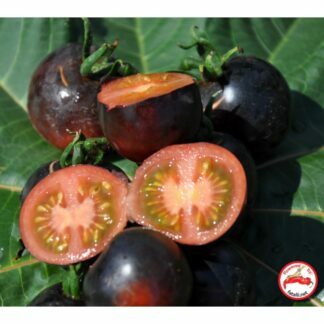 Maturity: early, height: up to 2.5m, grows in clusters of 12-16 pcs, plum-shaped, green-colored, weight: up to 50g each, the plant is covered with delicious fruit. 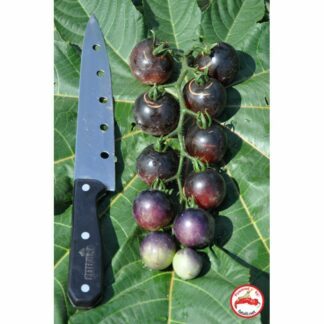 Cherry shaped, blue fruits with pink flesh in a strong, direct sunlight. 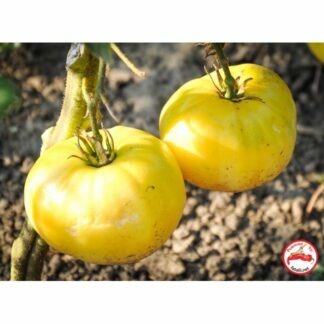 Some will mature to Yellow. Sweet taste. Bears fruits until frosts. 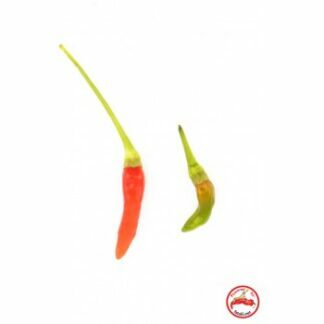 The unique variety. 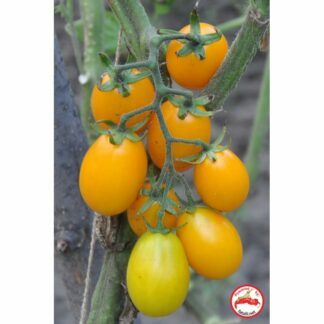 This variety is one of the world's smallest (ten fruit can find enough room in a spoon), also it is the very first to get ripen. 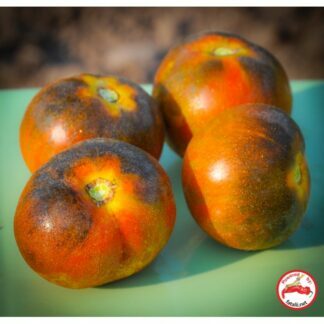 We ate the first ripe fruit on the 55th day after the emergence of seedlings. 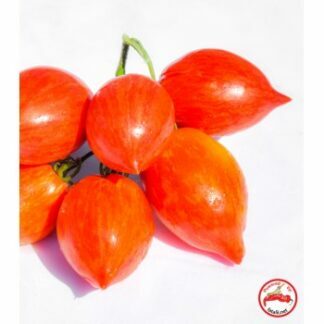 Height: up to 2m, red-colored fruit, very juicy and sweet. 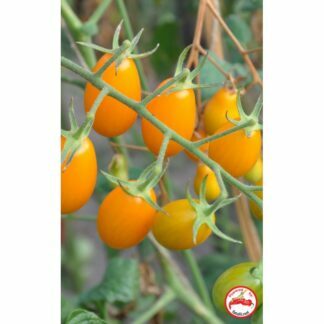 Leaves are round-shaped, an unusual decoration of the garden. I recommend it to everyone. 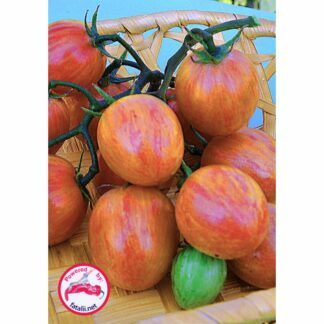 The earliest-ripen tomato, kids' favorite, a very rare variety. 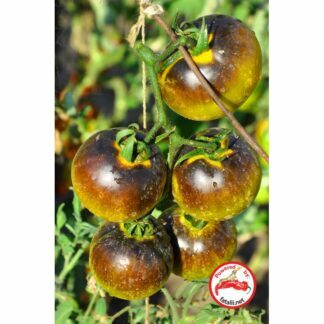 Maturity: early, height: up to 2m, coloring: pink with yellow stripes, elongated fruit 2-3 cm long, with a truncated pointed end. 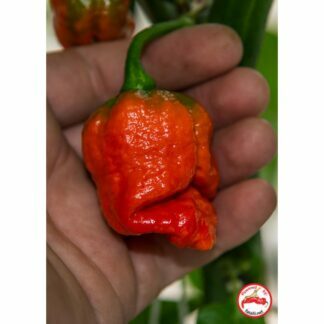 The yield is really incredible. 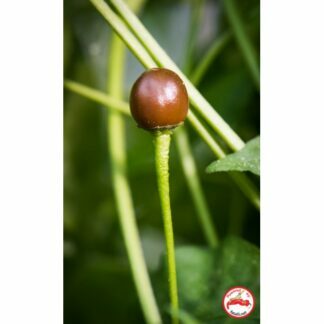 Height: 2m, maturity: mid-late, a powerful plant, fruit are heart-shaped, ribbed, red-colored, weight: 1kg or more. 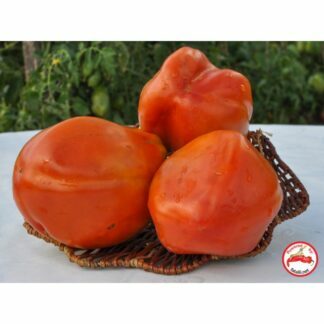 Very juicy and fleshy, the best for tomato juice and salads. Once you grow it you want to keep growing it for the next seasons too. 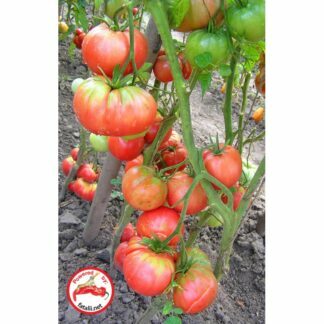 Tall, maturity: mid-season, fruit resemble figs, red-colored, tastes very sweet, weight: up to 20g each, the plant is covered with fruit, I highly recommend this variety. 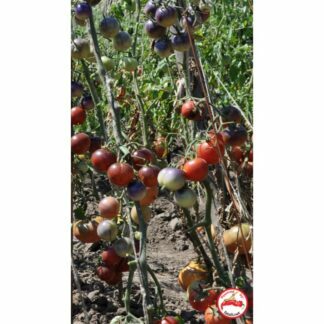 Maturity: early, height: 70cm, leaves and stems are also blue-colored, the fruit's surface is “velvety” by touch, fruit are globe shaped, colored blue with pink bottom. 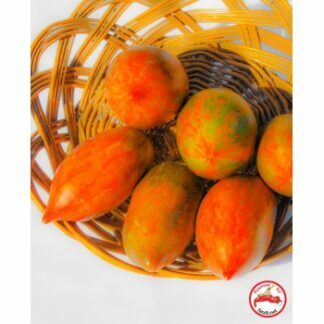 A time proved variety, fruit have the hen egg's shape and size. 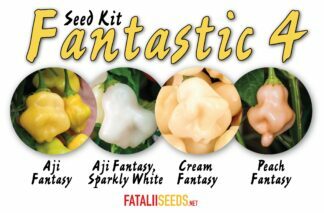 Prolific, tasty variety. Matures mid to early. 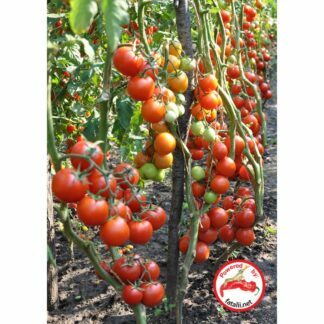 Plant height upto 150cm. 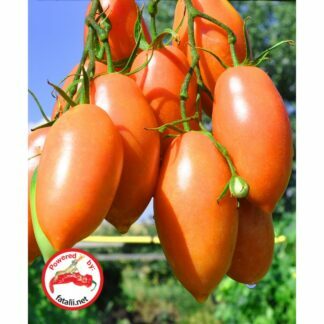 Fruit is pearshaped and weights approximately 150gr. 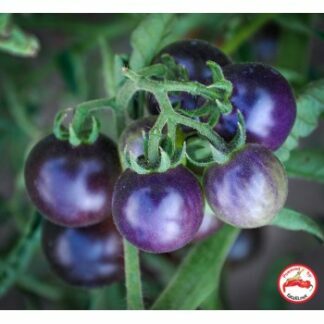 The fruits are blue (with high content of anthocyanin) the bottom turns chocolate when ripe. 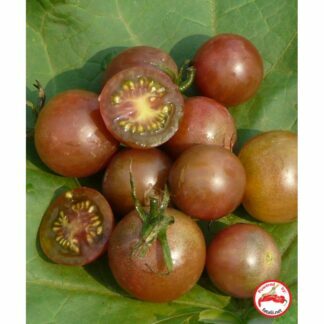 The flesh is reddish-pink, few-seeded. The taste is very sweet, like dessert. 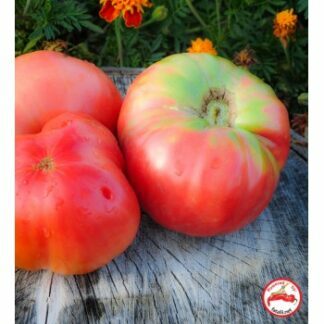 Disease-resistant, tolerates heat well. 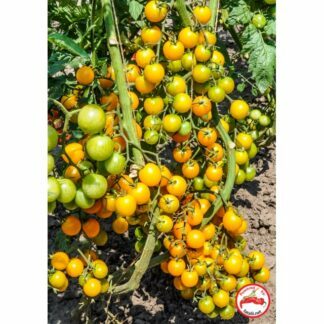 Ultrasweet yellow cherry tomato. 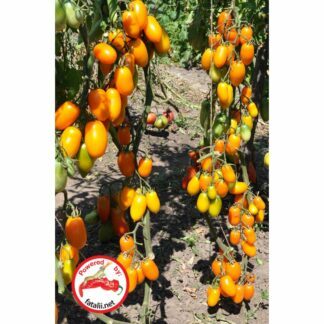 Maturity: early, height: 1.8m, elongated plum-shaped fruit, yellow- orange colored, weight: 30-40g each, grows in long tassel- looking clusters. Bears fruit until frosts. 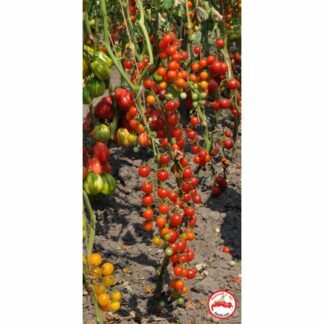 Matures mid-season with plant height upto cm 100cm. 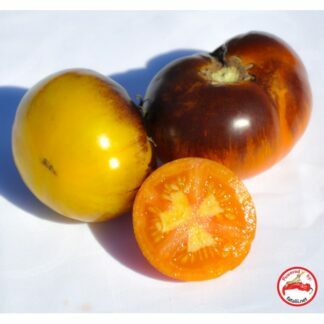 The fruits are bicolored and round and can weight upto 80 gr. The taste is sweet. 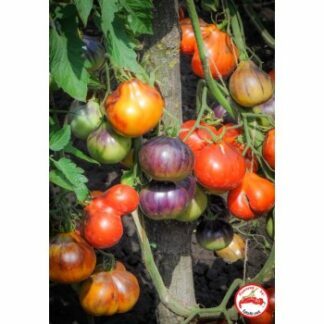 Fantastic fruits with dark green and purple stripes. Excellent for long storage. 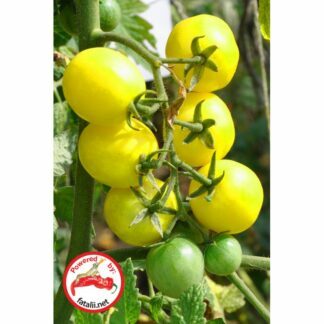 Fruit weight approximately upto 250. 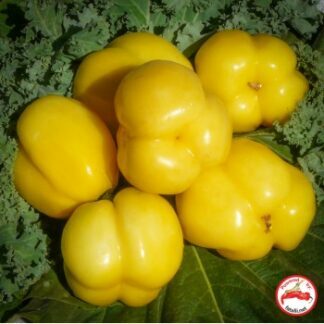 Taste sweet with fruitness. 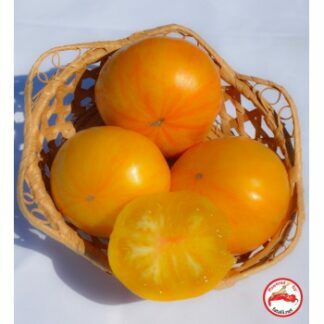 Golden fruits with lemon stripes, shining in the sunlight. Very unusual fruity flavor. 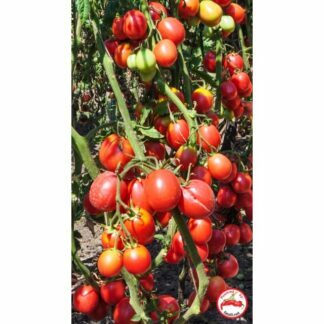 Matures mid-season with plant height upto 100cm. 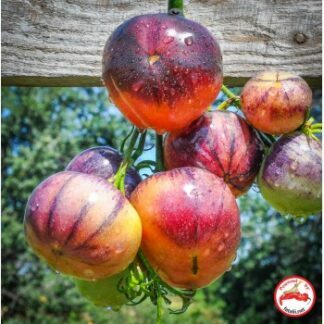 Bicolored, heart-shaped fruits, pink with green stripes. 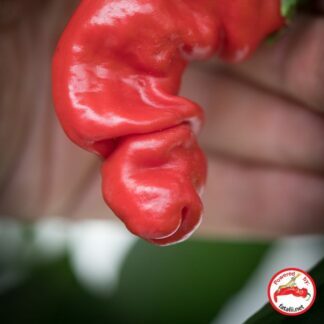 Very fleshy and sweet. 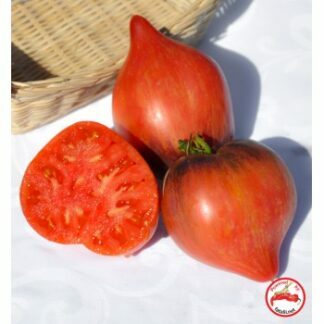 Obtained by crossing “Stupitsky” and “Chinese velvet” varieties, with the following selection in color. 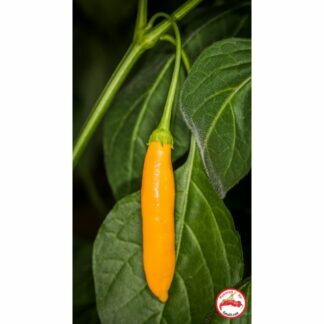 Height: to 1.5m. 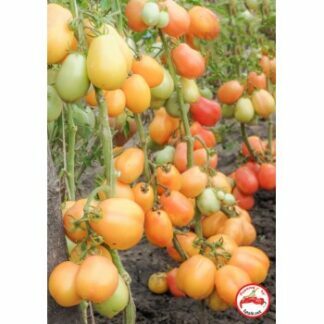 Fruit are globe shaped, coloring: pink with yellow stripes, weight: 40-60g each, fruit grow in clusters of 6 pcs. 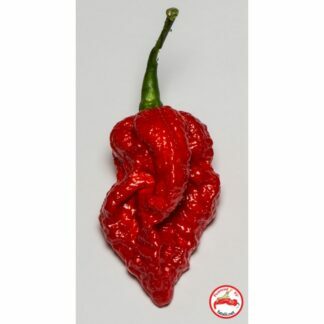 Has a pleasant sweet taste. 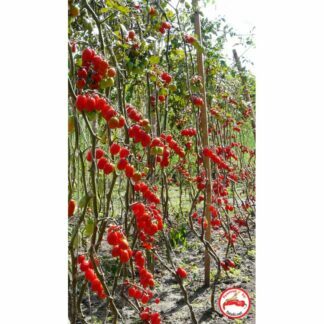 The fruit can be dried for winter and then used for cooking soup of borsch, yield: 15kg per a plant.